NetCloud Solution Packages for Branch Networks with the CBA850 LTE Adapter are designed as turnkey networking solutions for best-in-class 3G/4G/LTE failover that integrates seamlessly with existing network infrastructure. 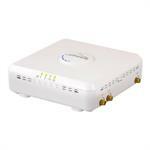 Packages include NetCloud Software, the LTE adapter and 24x7 support with Limited Lifetime Warranty on hardware. Upgrade to NetCloud Advanced for additional features, including Out-of-Band Management, enabling businesses to extend management capability to any primary router out-of-band.